and cuttings to a lush garden in just a few months. This is five months of growth in full sun. 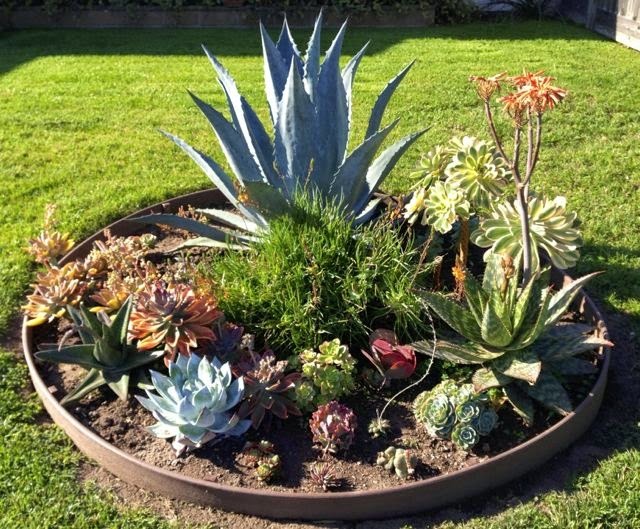 Succulent gardens add interest to ordinary landscapes. 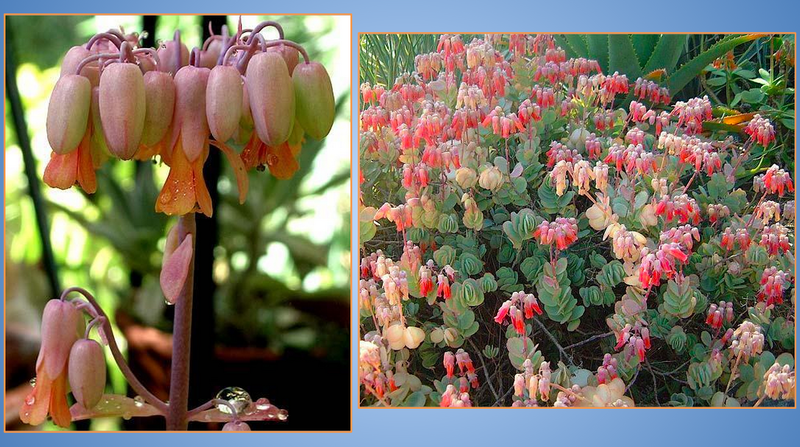 Because they look exotic, you might think succulents are difficult - to plant and care for. 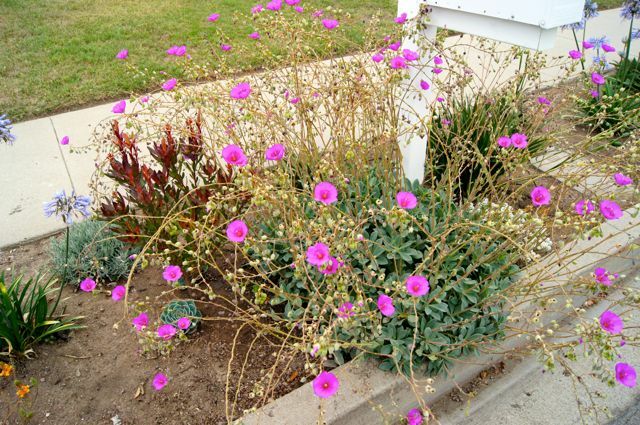 In reality, they are some of the easiest plants to grow. They thrive in conditions other plants would consider neglect. 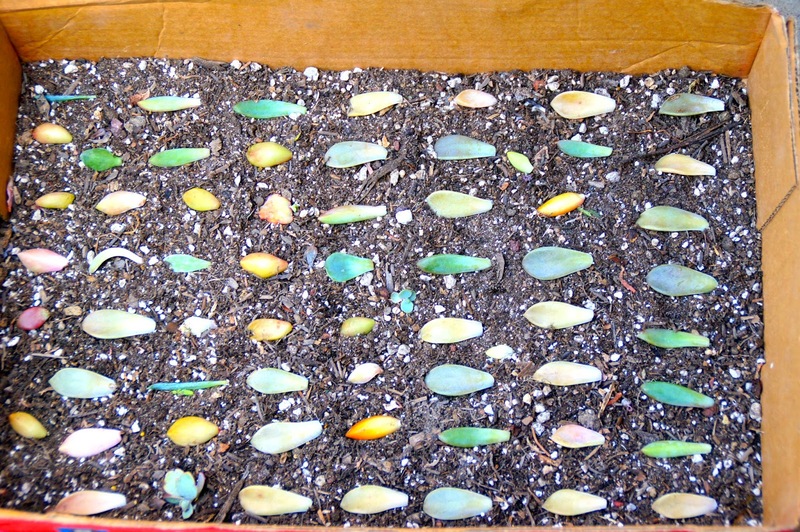 The key to a successful succulent garden lies in the right kind of soil and light. 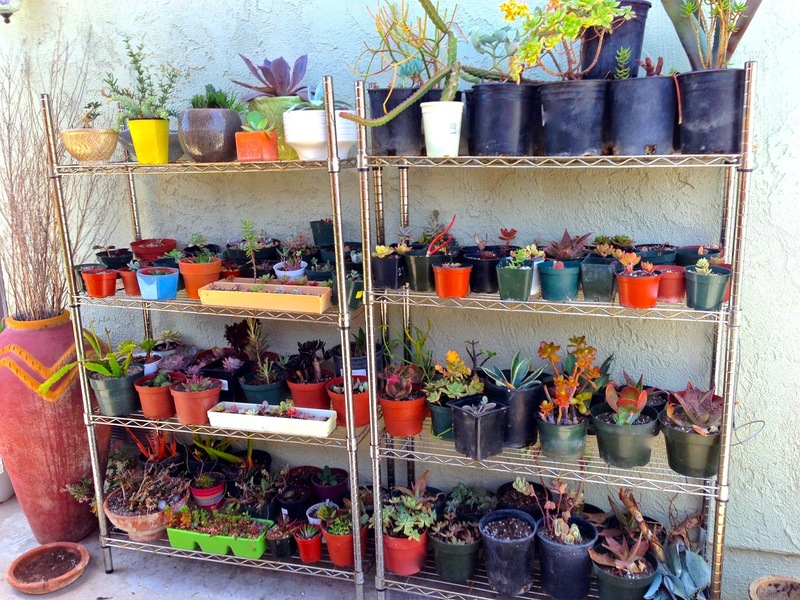 Once you master their basic needs, occasional watering is all you need to keep your succulents happy. 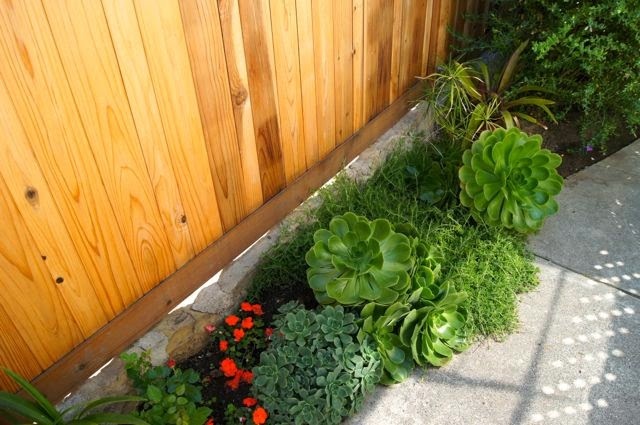 Choose a location for your garden that gets full sun to partial shade. Prepare the outdoor garden's existing soil by removing the grass and weeds and breaking it up with a shovel. 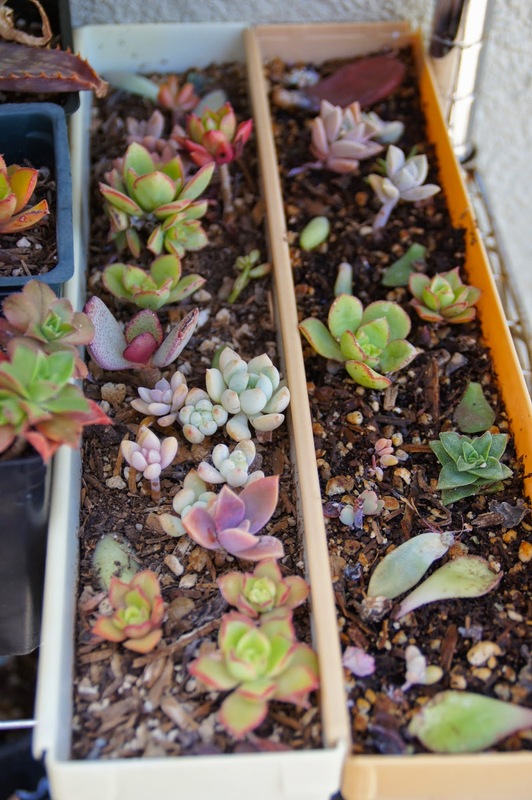 Create a fast-draining, succulent-friendly soil by combining equal parts coarse material, such as gravel or pumice, and either the existing garden soil or amend with cactus mix. It’s important to plan the placement of your succulents. Place them close together if you want a garden that's immediately full. Space them up to 12 inches apart if you'd like to give the plants an opportunity to grow and spread out. Wait up to a full week before you water to allow the roots to recover from any possible transplant damage. Ongoing water and maintenence needs are discussed later in this presentation. 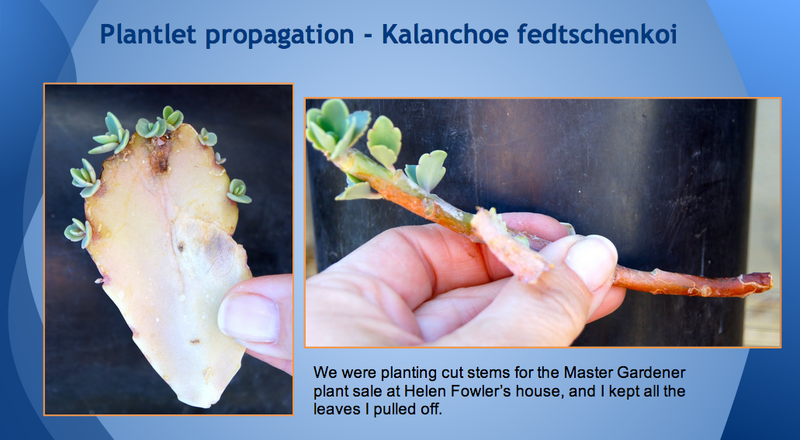 For me, one of the more enjoyable aspects of growing succulents is their propagation. Cutting propagation. 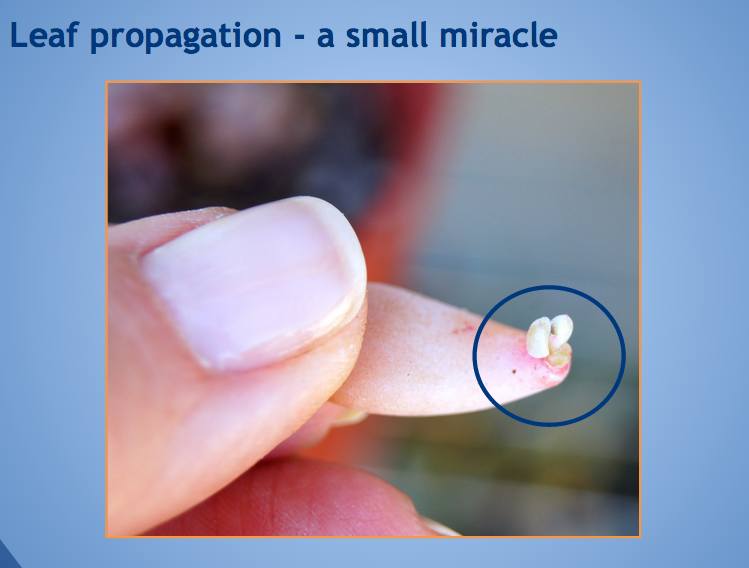 One of the most simple techniques of propagation. These plants were grown from cuttings used in my wedding bouquet. You simply cut and plant immediately in soil. You don’t have to let them heal over if you don’t water for a few days. Plantlet propagtion. These plants are vi·vip·a·rous: Which means they reproduce from buds that form plantlets while still attached to the parent plant. To root, place plantlets on top of soil in small pots. and large open spaces providing lots of color. 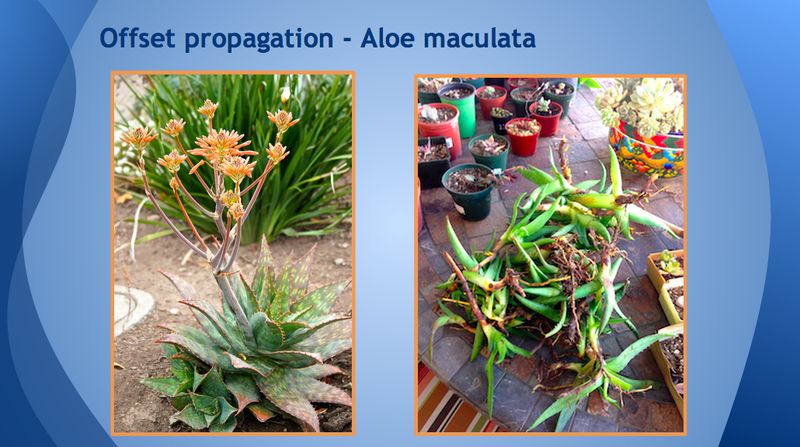 Offset propagation - Numerous glob-ular cacti and leaf succulents (Agave, Aloe, Haworthia) form numerous offsets or pups, which can be planted if rooted. If unrooted, root in pumice. 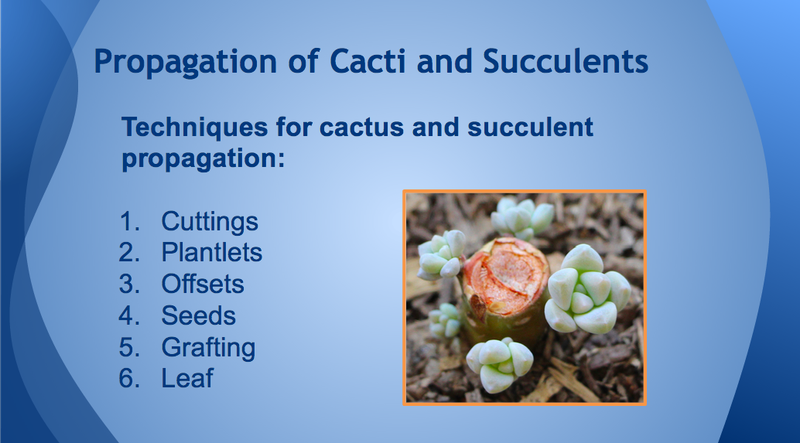 Seed propagation - Most cacti and succulents can be raised from seed. As home gardeners you may not want the huge quantities of seedlings but seed propagation is frequently used by commercial growers. Grafting - is done for various reasons. 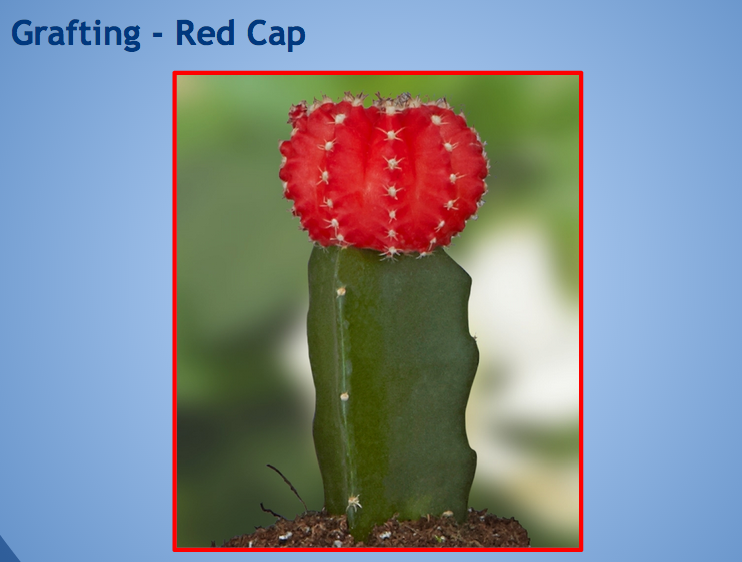 The most common you see is Cacti that lack chlorophyll — like the "Red Cap” this brightly colored plant results from grafting two different species of cactus together. and keep them out of the sun in a cool dry place. Once you see roots or a bud you can just lay them on top of some soil. Regular cactus mix works best. I lay them flat because that is what happens in nature. Then I pretty much leave them alone. Once in awhile a splash some water on them when I think of it. But, these haven't had any for at least 2-3 weekes. Now that these have really taken off I might mist them. I also put a bunch of leaves on top of the soil in every pot I have growing in my propagation nursery. DON'T touch the leaf until it shrivels up and comes off. Don't try to remove the dead leaf. Just let nature take its course. 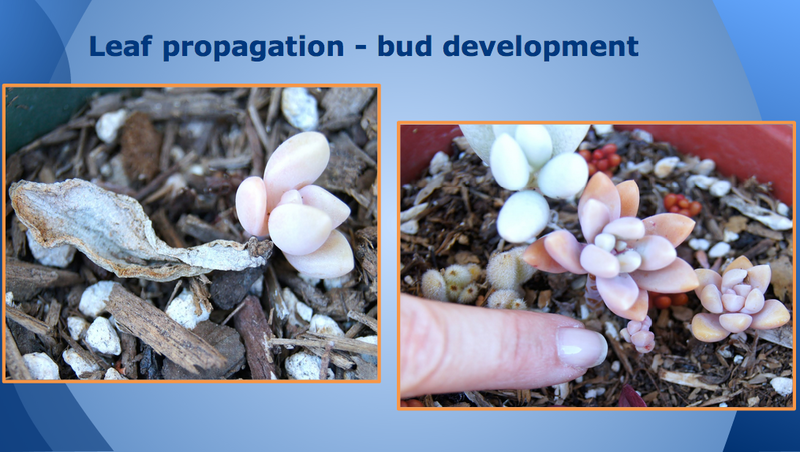 Once the new bud starts to form it uses the nutrients from the leaf as it grows. Eventually the leaf shrivels up and roots take hold as it keeps growing. My succulent cuttings nursery. It's so great to go shopping in your own yard. Various leaves that have grown into tiny plants! All of these were cuttings that grew up. All grown up. From one tiny cutting I have had dozens of plants flurish. This is a small pocket garden that I put in my front yard. All of these plants were grown from cuttings as are most of my succulents. When this was written I still had a lawn. 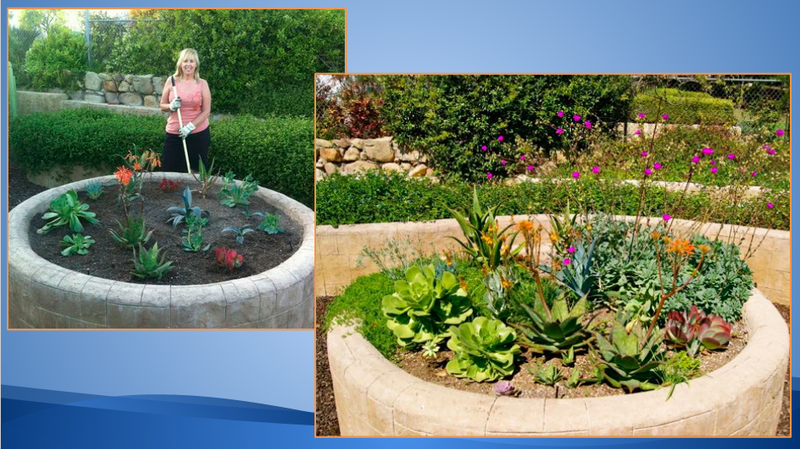 This pocket garden was installed as a test garden to learn what plants do well in this location. Thank you for visiting my blog. Please leave a comment and share your propagation successes! Subscribe to my blog for more great information and DIY projects. Thank you Deana, for posting this. It is really helpful. I have some leaves that are finally starting to have little roots appear. I will keep watching them and let you know when they are ready to plant. 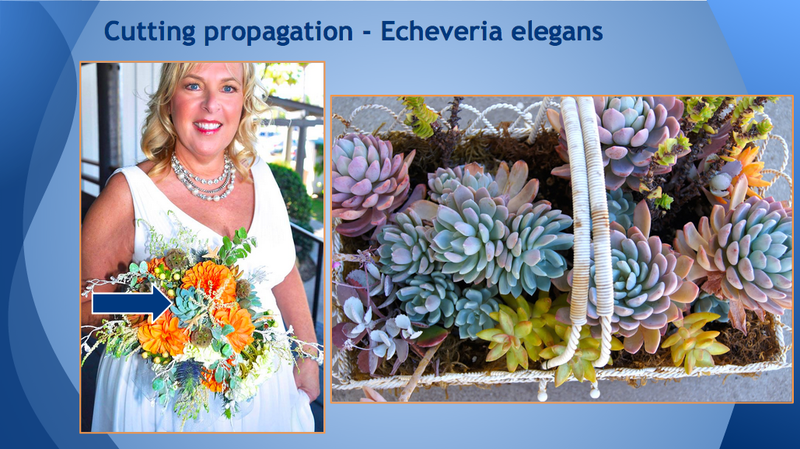 Now I have some echeverias that are giving me trouble with where they like it best---sun or shade. I think they should hae sun, but the leaves are shriveling up and I wonder if the sun was too much, so I gave them a little water to see if that might help. Thanks for all your help. How exciting you have little roots! 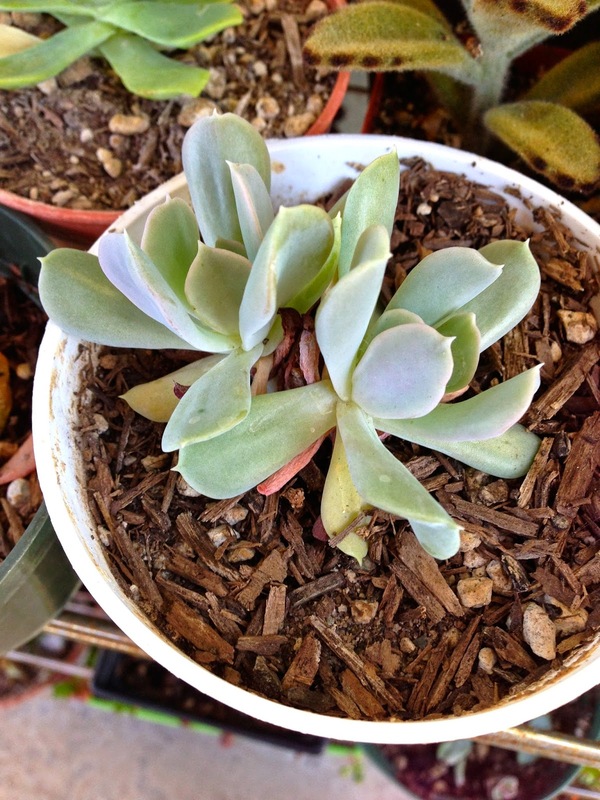 It's trial and error sometimes with certain varieties, but succulents are very forgiving. Hi Deana, just stumbled upon your site. Love you beautiful succulent collection. I've never seen half the variety of succulents you have here in my city, Ottawa, Canada. 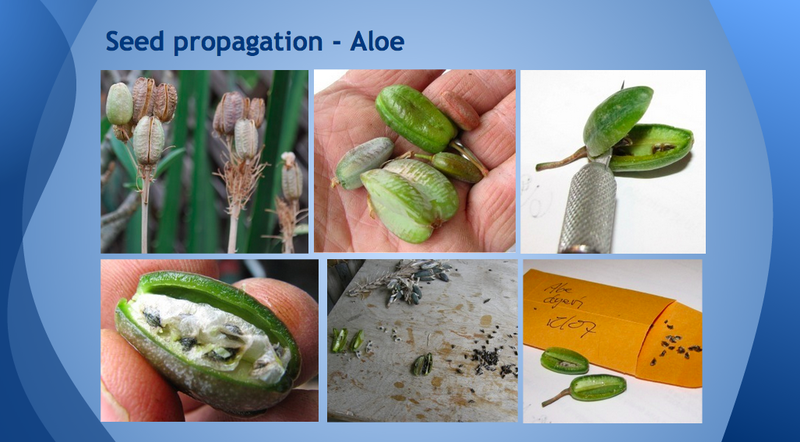 I haven't tried propagating from seeds although I have had great success from leaves and offsets. I have a new bowl full of baby donkey's tail I put together from fallen leaves. 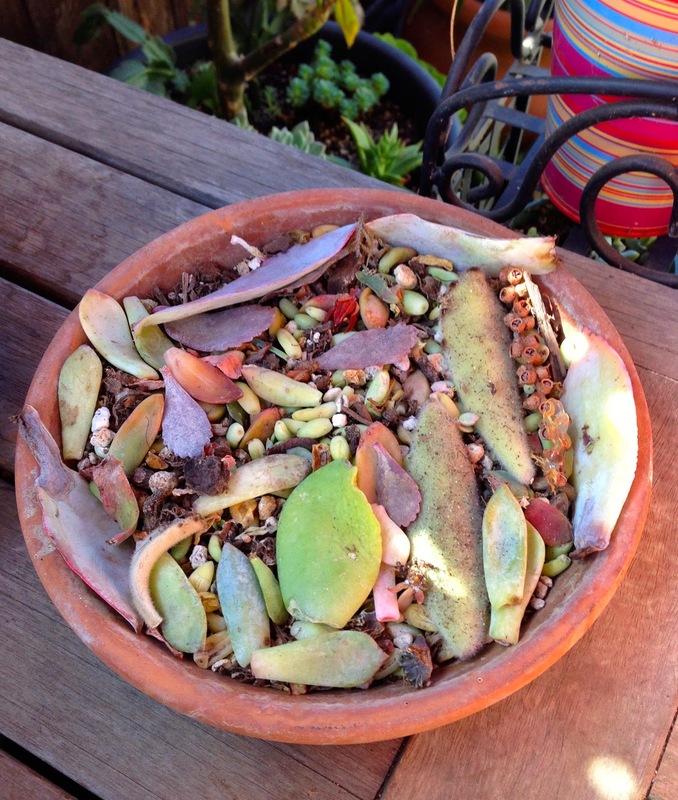 I just love succulent propagation! Sorry for the delayed response. I don't get notifications when I receive a comment. Will try to fix that. Thank you for your compliments. Fun with succulents!